Hurricane Harvey struck Texas hard. Roadways that had never flooded before were underwater. Besides preventing residents from leaving flooded areas, the water also kept those bringing in emergency help and supplies from reaching victims. TxDOT crews were on the scene to help with cleanup and repair of damaged roads and signals. They also assisted in a number of high-water rescues of people stranded in their homes; but something more was needed to open the major roads blocked by floods. In Austin, TxDOT employees manned the agency's emergency operations center 24/7 and tried to find ways to help the flooded communities. 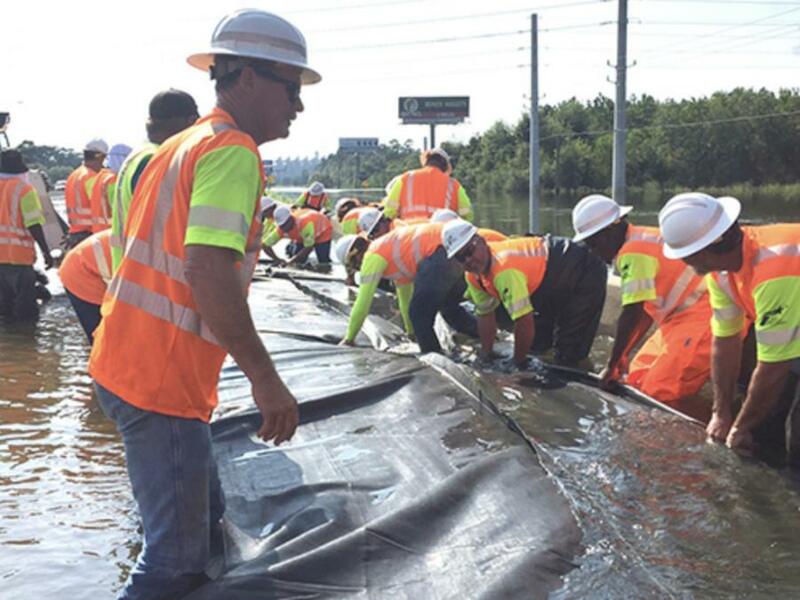 Using technology that was new to the agency, TxDOT was able to step in and provide relief for some badly flooded roadways in Houston and Beaumont. Seven miles of AquaDams were purchased from Aqua Dam Inc. of Louisiana, and were transported by semis to both locations for use. “Austin purchased this equipment as an opportunity to use a product that was new technology and was thinking outside of the box,” said Cory Taylor, director of maintenance in Beaumont. AquaDam is a large mobile dam that can be used to block off up to 30 in. of water that is rising or already in place. In the event of a flood, this “water bladder” uses existing flood water to fill up the structure and create a barrier, effectively taking the problem and turning it into a solution. 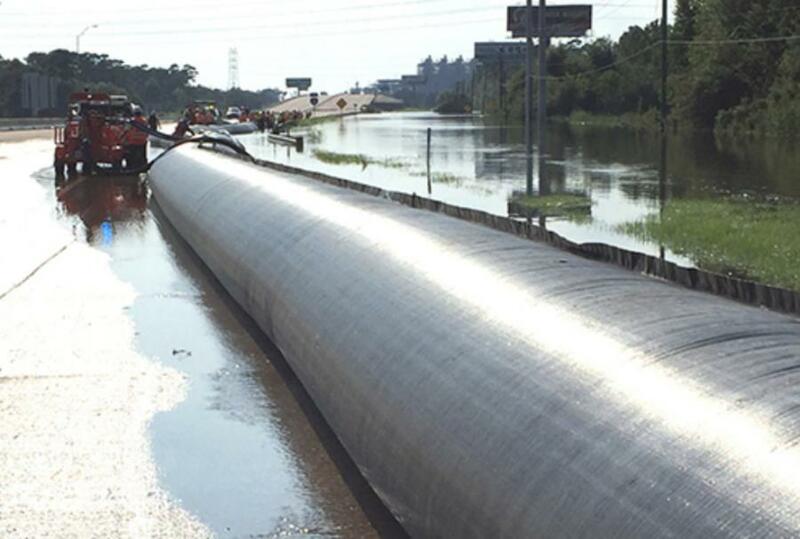 TxDOT's Houston and Beaumont districts received shipments of AquaDams, delivered directly from Louisiana to the sites from the vendor to open roadways after Hurricane Harvey devastated both cities. The first installations occurred in three different locations in Houston on Aug. 29. A day later, Beaumont began two installations, both on Interstate 10 — one on the Harris County line in Mont Belvieu and another on the Texas-Louisiana state line in Orange. The Beaumont District did not work alone. Visiting crews from TxDOT's Brownwood, Dallas, Tyler and Waco districts provided assistance. The crews were able to finish both installations within hours — eight hours for one and four hours for the other. The AquaDam installation, less than a mile long on the Harris-Chambers County line, opened up about 15 mi. of I-10 that was previously blocked. Installation wasn't accomplished without problems, though. The conditions of the floods contributed to the challenge. TxDOT took a chance on new technique in dangerous conditions, and it proved to be effective. “The more we learn about using it in the right application, [the more we realize] it's definitely a good product,” Taylor said. The AquaDams remained in place until they were removed on Sept. 13.